I don’t know if it’s typical, but my best memories of Easter baskets as a child are not really candy related. Each year in addition to candy, the Easter Bunny left a few trinkets in my basket. One year it was a hip 90’s Yo-Yo Ball, sometimes it was pretty hair bows, and once it was a kitten. Now, since a kitten a year is probably not feasible – I’ve been working on a great DIY trinket that is a great addition to any basket. 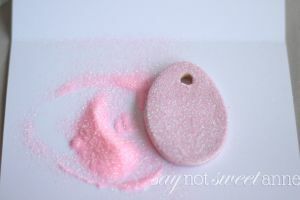 DIY projects are easy to customize and could be made every year for a special Easter collection. 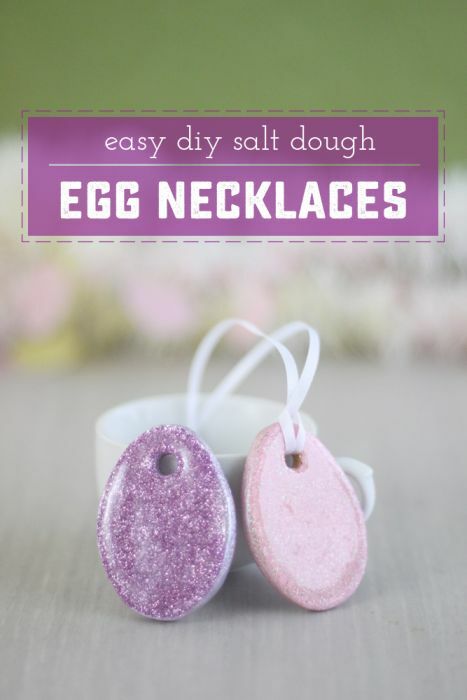 Plus, this concept could be applied to any number of ideas, not just an Easter Necklace. Oven, or small toaster oven. 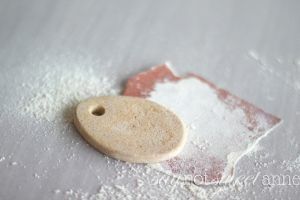 Start with your dough, roll it out to about 1/8 inch thick and use your cookie cutter to cut an egg shape. Be sure to cut a hole for it to hang from! I like to use a straw to poke out a perfect circle. Bake your dough low and slow (to prevent puffing) I like 250° for several hours, until baked all the way through. I use a small toaster oven for this. 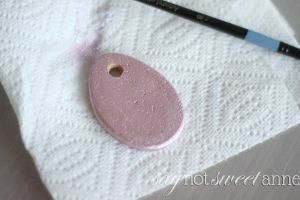 Paint the egg in your desired base color on the front and back. Let dry. 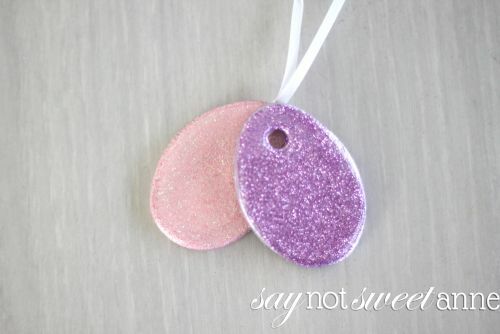 Use the Mod Podge to coat the front of the egg, and cover with your coordinating glitter. Let Dry. 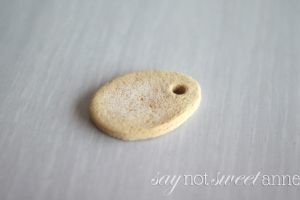 Seal the front and back of the pendant. I love Mod Podge Dimensional Magic for the front, you put it on thick and it makes a really nice glossy depth. 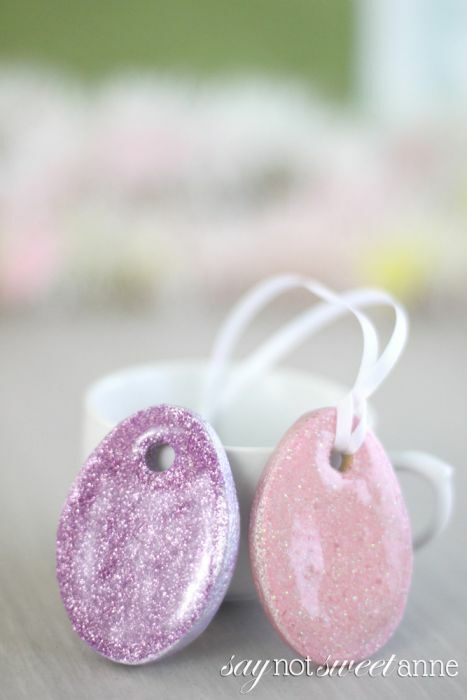 You could use regular Mod Podge all the way around though, just to seal the glitter. Let Dry. Done! 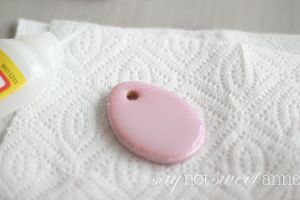 Finish with a lovely ribbon, or a chain, or leave it as is and put a magnet on the back.